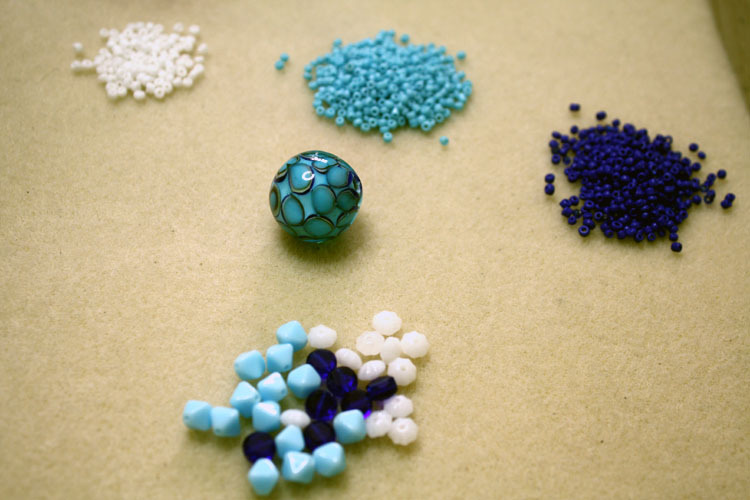 Because of the vacation, I was working without an actual bead table last week. Of course, that didn't stop me from making sure I had some beads with me. (Have crafts, will travel.) Yet, the lack of internet DID stop me from posting about it. 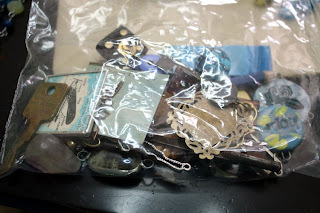 Before I get to today's bead table, I want to brag about how I was able to condense my traveling crafts into one small box. 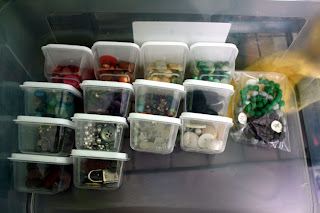 The bulk of the beads and buttons (sorted by color) that went with us. There were also a few small pill boxes of seed beads that didn't get photographed. I ended up only making two necklaces while we were out and about. The first while we were staying at our friends' house in Florida and the second while we were relaxing on the beach in Alabama. I think you can tell where I was with both of them. . .and thus what inspired me. While I'm still amazed at how much I packed into that one little box, I'm happy to have full use of my craft room and bead table once again. However, I am currently limiting myself to working from the little bag of focals for the time being. I'm hoping that this limitation will spark some creativity on my part as I sometimes feel overwhelmed by the abundance of materials I have stockpiled. From that bag, I did pull out a lampwork bead that I've been holding onto for YEARS and began picking out some complementary beads. While I've got you here, let me share some giveaways and challenges I've come across in the last day or two. I think the first one might be perfect for me as I limit myself to those focals. 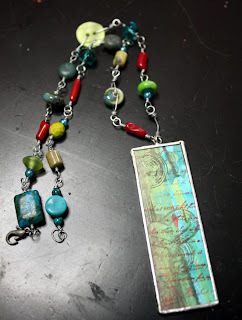 Art Bead Scene is having a 'Muffin Tin Challenge." 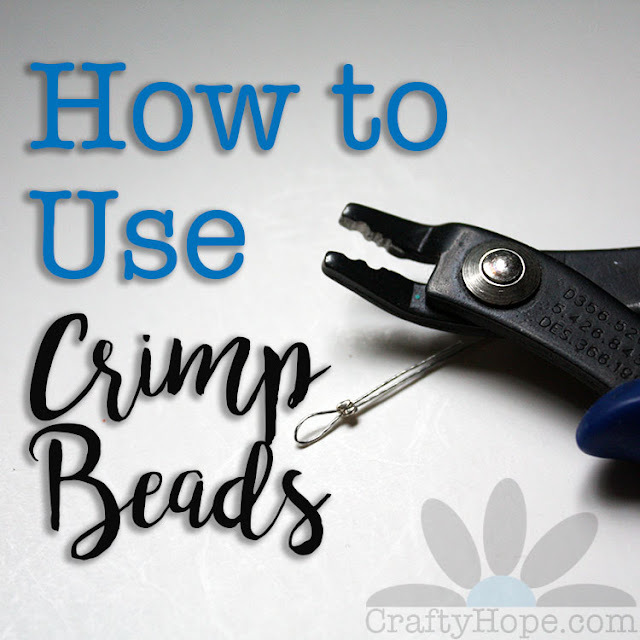 The details are pretty cool, fill each of the 12 cups in a muffin tin with the supplies you need for a project (one cup=one project) and then take a week to complete each project. Post your tin and projects for a chance at a prize. Cool huh? There's a Silly Lillypilly Pendant Contest over at Blog for Beaders. 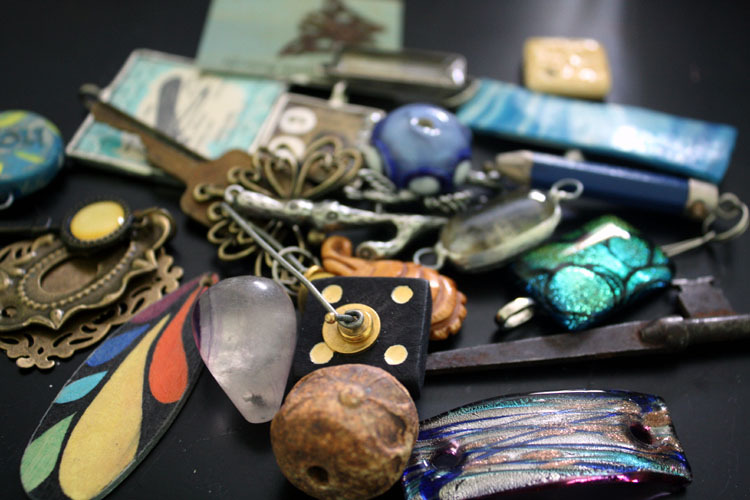 Simply choose your favorite Lillypilly pendant and e-mail your pick for a chance to win it. Easy! Craft Gossip is giving away two Penland Craft Books. Just leave a comment about what inspires you. Lastly, Michelle Mach has a fantastic roundup of bead and jewelry contests. Hers is a much more complete list than this one! Now to get myself a 12 cup muffin tin (all mine are 6 cuppers. . .)!! I do love that necklace -- and you are a miracle worker to get all your stuff in one box! I bow to your skills! I'm still not sure how I did it. But, I am glad I limited myself since we were moving around quite a bit. If we had stayed in one location, I would have definitely taken more. But, since I knew I had to haul it; there had to decide what I absolutely wanted to haul around. It was definitely a neat exercise in restraint! Great pix, you are very organized- wish I could be... I try. Thanks for your nice comments on my Bead Table Wednesday photos! 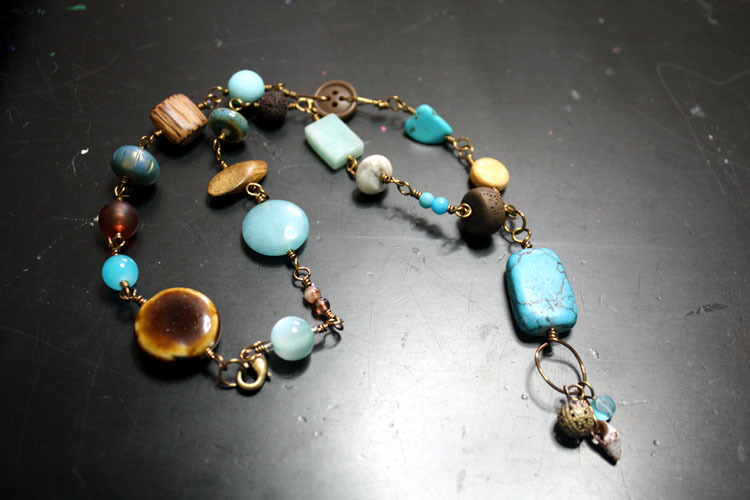 Hi Hope, I really like the second necklace there is just something about blue and brown that's soothing to me. 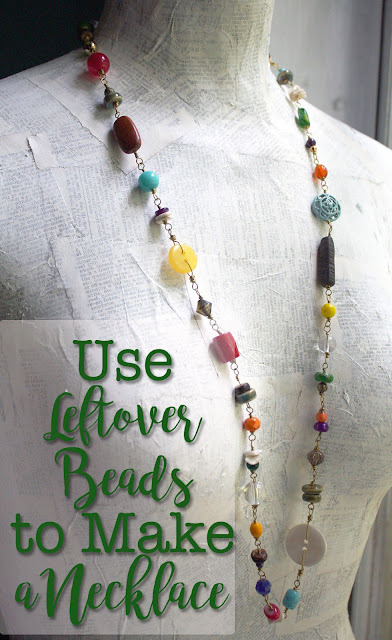 Can't wait to see what you do with the focal bead and the other beads that go with it on your table. WOW Hope, this was an AWESOME post! I hate leaving my supplies at home- love to travel, but feel naked without craft/art supplies! 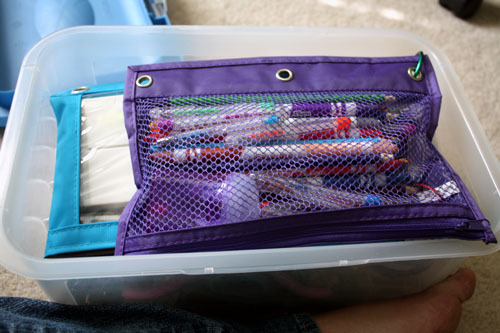 I love how you packed your supplies! 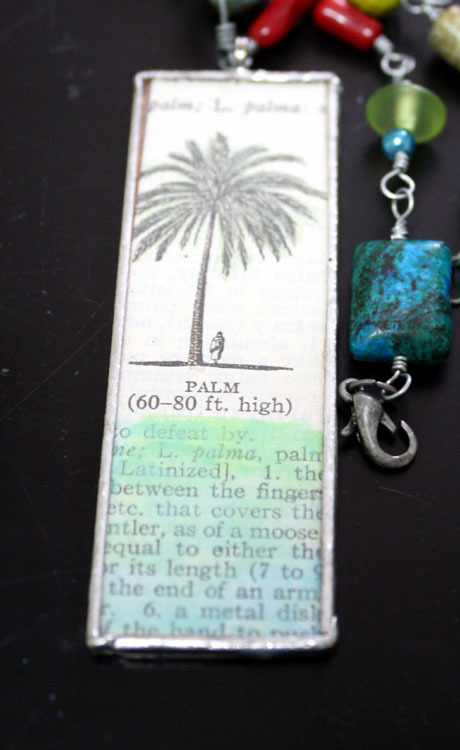 Thank you so much for sharing...and, I am a BIG fan of the beach made necklace- gorgeous! Heather- Don't let the pictures fool you, I'm nowhere near being organized. I just play one on the internet. . . ;) And, You're VERY welcome! Therese- Yeah, blue and brown is probably my favorite color combo. In fact, that's the shade of most of my clothes. (Makes getting dressed easier) I did finish that piece and am trying to decide how much I like it. 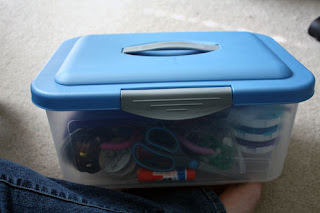 Ooohhh- bungie cord is a fantastic idea for keeping it together! Erin- I'm so glad you enjoyed this post. Yes, I must always have my supplies too and have messed around with a few methods for toting them, but this one really worked out well. I'm glad you like that necklace, it just kinda grew into that. Funny how those necklaces will do that. I love those boxes - hadthe kids toy sets grouped in them and as I have gotten rid of toys they have become mine...muwahahahaha. I love all your beachy goodness! Looks like you had fun AND got to be creative! Patty- Yeah, those boxes rock. I do have several of them around the house in different sizes and purposes. But, I went out and bought this one expressly for this purpose. Wonderful! Both necklaces are really cute. You CAN really tell where they were made by looking at them. How funny is that? I love the subdued colors of the beach one. It's so relaxed and low key. 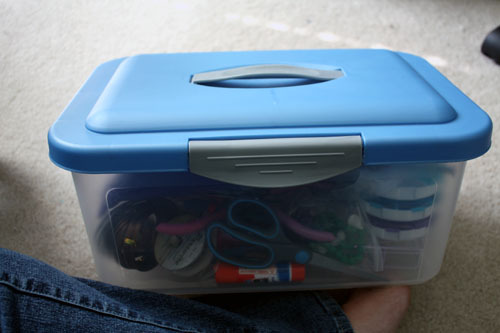 :3 You did manage to pack a lot into that little box; I could learn a thing or two from you. When I take stuff, I pack a whole suitcase. XD My fiance is always picking on me. 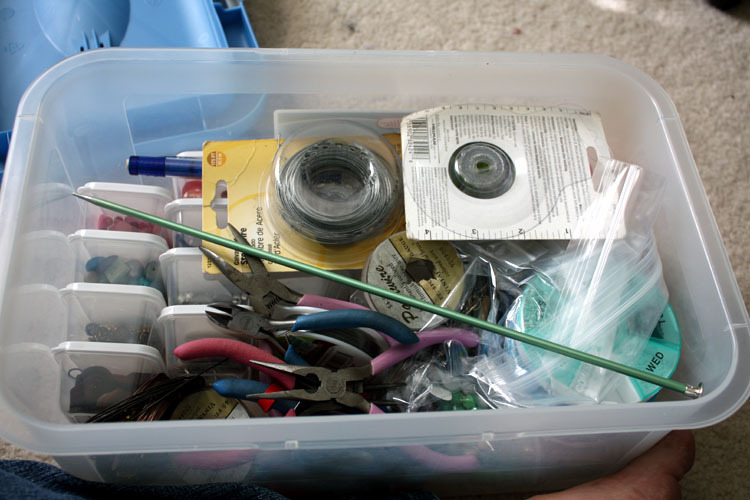 Also I definitely hear you about being overwhelmed by the amount of choices when sitting down at your beading station. It can make you go cross-eyed and give right up. So maybe I'll take your advice sometime and try limiting myself to just a few things and see what happens. Glad to hear you had a good time on your trip! Jacinta, That small amount was a first. You should have seen all the other bags I took. There was a HUGE suitcase of clothes, a bag of books and electronic supplies, and then a cooler and a bag of food. . .I packed down that little Kia Soul they rented us!